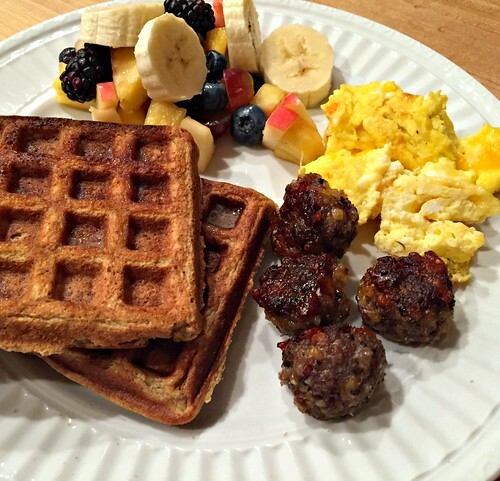 So a while back, I decided to make “breakfast meatballs” as I called them — using sausage, oatmeal, egg, seasonings, etc. Basically my normal meatloaf recipe, just with sausage instead of beef, and oatmeal instead of breadcrumbs. The results were OK, but not amazing. 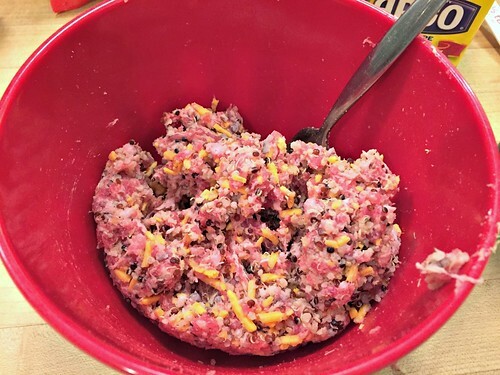 I skipped the egg entirely as ground sausage is much “stickier” than ground beef, and I didn’t need any seasonings (not even salt) as ground sausage already has seasonings mixed in. 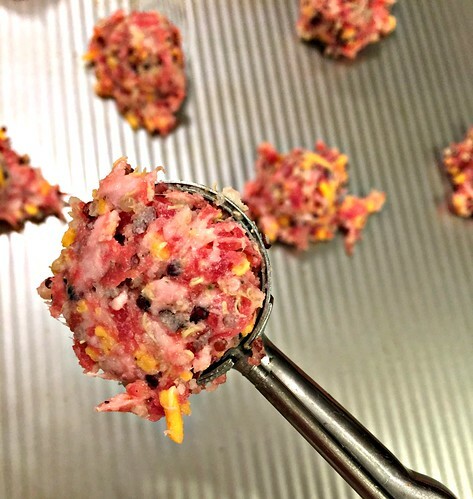 These Cheesy Sausage and Quinoa Balls have been a welcome addition to our hot breakfast rotation, a quick snack (yes, we eat them cold from the fridge) and even quite yummy with zoodles, spaghetti squash, or regular pasta noodles! And just wait until you see how quick and easy they are to make! **NOTE: you can sub 1 c. cooked rice, 1 c. cooked oatmeal, or 1/2 c. bread crumbs if you don’t have any quinoa on hand. However, the quinoa really does give great flavor and texture! 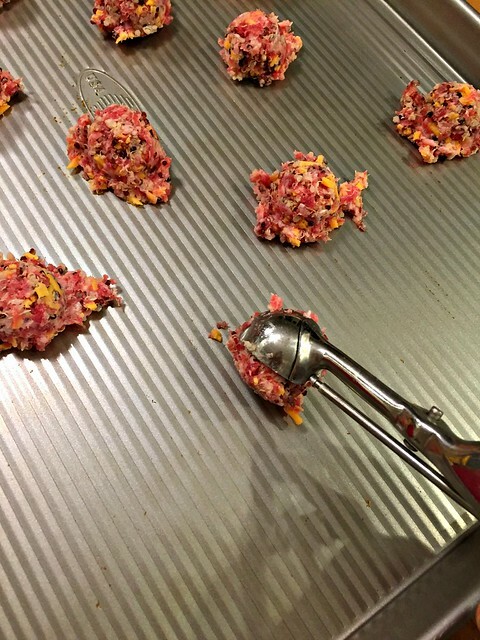 Scoop out heaping teaspoons of meat mixture, form into balls, and place on large baking sheet. 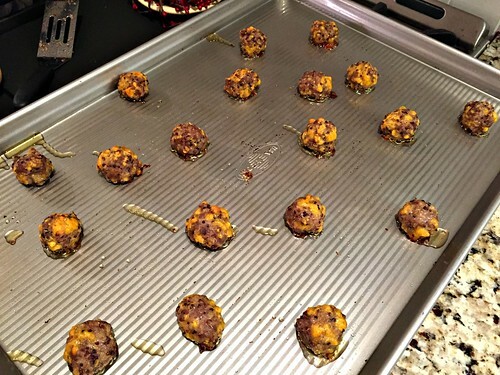 Cook sausage balls in preheated oven for 18-20 minutes, or until cooked through (longer if you make them larger). Eat and enjoy, or refrigerate for later! 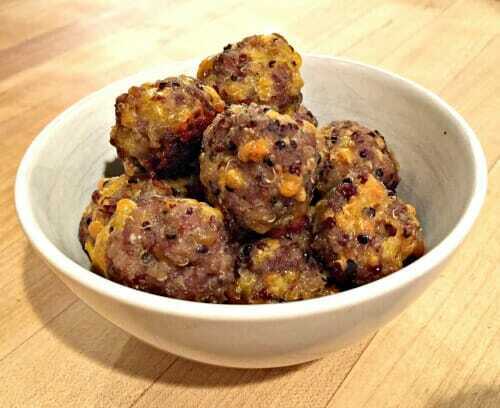 You can easily make these sausage balls in advance and store them (cooked or uncooked) in fridge or freezer. 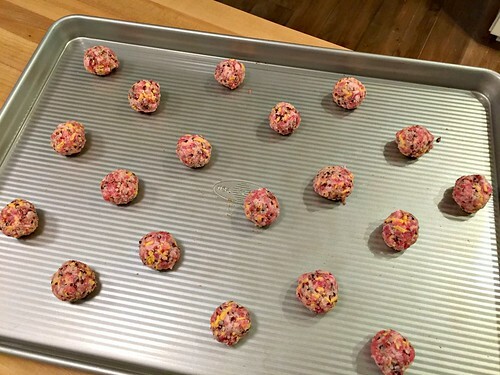 Just make sure to “flash-freeze” uncooked balls on a cookie sheet before you dump them in a bag together, otherwise they’ll freeze together and you most likely won’t be able to separate them! Since I use cooked quinoa in my recipe, I can have these sausage balls ready for the oven in 10 minutes (seriously, I’ve timed myself)! If you need to cook the quinoa first, just follow the directions on the package and let it cool for a bit before adding the sausage, cheese, corn starch and pepper. Thanks to all my research on grains, I’ve learned how amazing quinoa actually is, and we try to eat it very regularly! I cook large batches of quinoa in my rice cooker, let it cool, and freeze it in zip-top bags or food storage containers. It goes well with so many different types of food, and I frequently add it into various casseroles, soups, stews, egg dishes, and even salads! It’s a complete protein, providing ALL nine essential amino acids our bodies need (including Lysine, which is absent from almost all other grains). 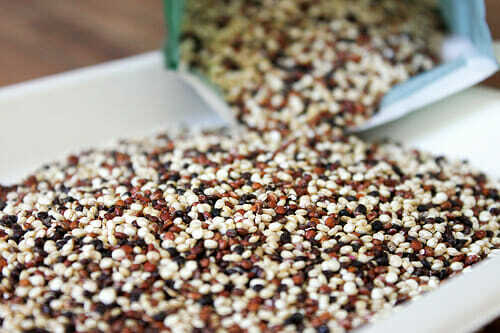 Quinoa is loaded with healthy fats, iron, calcium, and vitamins. It’s also super quick and easy to make, readily available in almost all grocery stores, and really tasty! So there you have it — healthy, nutritious, tasty, and extremely simple! What do you think, breakfast… dinner… or both!? We loved these! I’ve just had to make my second batch this week as my toddlers have gobbled them all up in 4 days!! oh good — glad to hear this! yes, I can attest to the fact that it IS good with pasta sauce and zoodles! I’m dairy-free, so I was wondering if you might have an idea of what I could sub for the cheese. I’ll probably do some according to your recipe for my family, but I definitely need it without the cheese. Thanks! I’d just leave it out — but if you’re dairy free, I’m guessing you have experience subbing different things for cheese, so just choose something else you regularly sub. I’m printing this recipe out and trying in out soon! Did you use a “flavored” sausage like Jimmy Dean or just plain ground sausage? We love quinoa in our house and I freeze it just like you. And my kids love it. In my experience, any type/brand of ground “sausage” already has all the seasonings mixed in as the seasonings are what make it “sausage”. Otherwise, it would just be ground pork. I guess I really don’t know what “plain ground sausage” would be, so in that sense, yes, my sausage was flavored with sausage seasonings. I cannot get my kids to like quinoa. 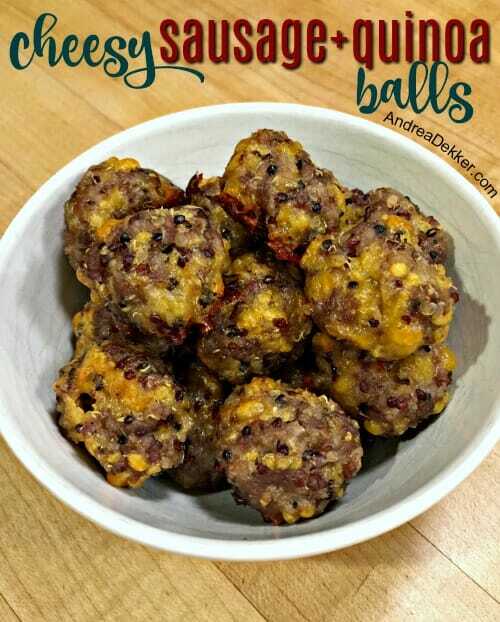 Definitely gonna try these balls… do you have any other things you mix it with? 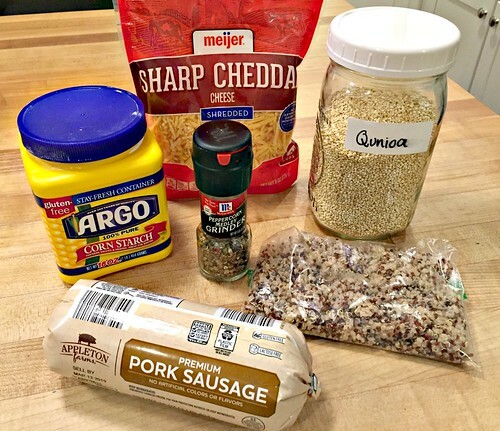 nope, just exactly as the recipe states — sausage, quinoa, cheese, pepper (and a little cornstarch) easy! I’ve done quinoa, egg (to bind it together), mozzarella cheese, Italian seasoning – bake in a muffin tin and dip in marinara. My kids love them! yum — I’ll have to try this too. I could even do it in a mini muffin tin so they are “bite size”! OMG, thank you for this! My college daughter is GF and we are huge fans of quinoa (thank goodness for the Instapot…so easy to cook it in there)! I cook a big batch of quinoa every few days freeze it in one cup portions and eat it almost every day for breakfast with a little butter and salt. I love it. I often eat it for breakfast too! I love it in so many different contexts and with so many different flavors! Sounds Good! I may need to try these! You’re STILL my favorite blogger! Also, did you happen to get my emails last week? I’m wondering if you mind if use your APPLE analogy for clutter control in an upcoming blog post!?! ?